I feel that jazz is not so much a style as a process of making music. Jim is from a generation where people are very, very…I don’t want to say close-minded-but very much set in their ways and established, and have firmly established the way they are going to sound for the rest of their career. Jim seems to be a work in progress. I want to be like him when I grow up. I still want to be moving and searching and growing and absorbing and trying to rework things and unlearn what I’ve learned and then learn it again. The guitar is still a mystery to me. So, this is how the world ends-not with a whim but a banker. There’s nothing quite like taking a high-performance car out on the Autobahn and shifting into overdrive; opening up the engine; feeling that surge of power as light and sound dissolve into a blur of locomotion. However, were you to downshift into a lower gear, your perspective would be radically altered; you’d not only have the forest but the trees, as the haze of primary colors snapped into sharp focus, and suddenly you’d be able to perceive subtle nuances of brown and green and turquoise with the eyes of a child…or a painter. 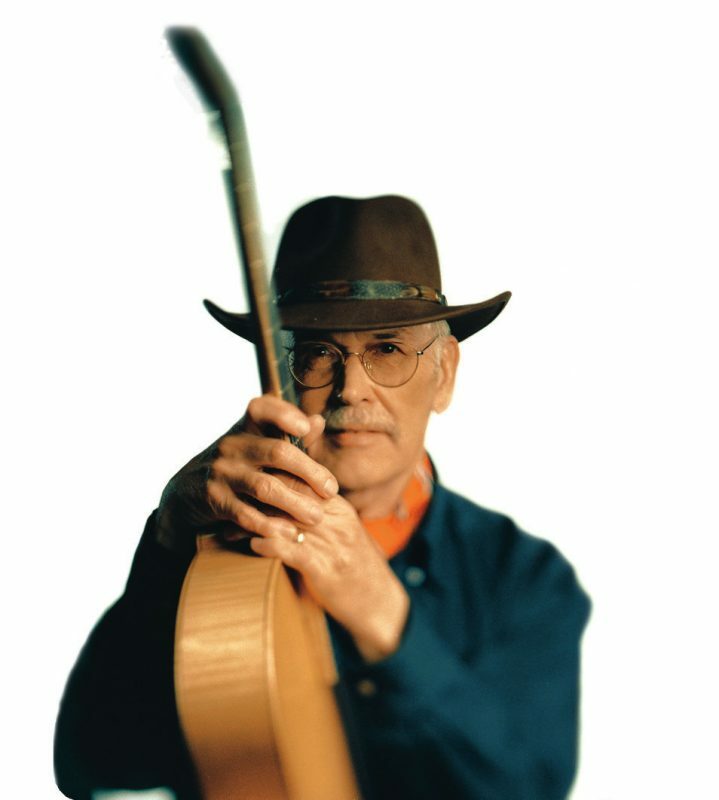 Jim Hall’s quiet, supple artistry transcends the instrument itself-he is the emperor of cool. In the tradition of bluesy minimalists such as Count Basie, Lester Young, Ben Webster, Johnny Hodges, Gil Evans, John Lewis, Gerry Mulligan, Miles Davis, Chet Baker, Chico Hamilton, Paul Desmond, Thelonious Monk, and Bill Evans, Jim Hall is not so much concerned with the means, as the ends. He is a genius at playing next to nothing and imbuing each note with a deep spiritual hue. Hall is a master listener, a virtuoso of silence and inflection…the pregnant rhythmic pause. Nor does Jim succumb to the allure of facile pattern playing; he constructs phrases; he makes music: lyrical, understated, melodic improvisations, marked by coy syncopated disjunctions, elegant conversational counterpoint and luminous harmonic architecture. To this listener, Jim is the Monet of jazz guitar, with a painter’s eye for shape and shadow, color and texture, balance and form. “To me, Jim illuminated the potential of the guitar by facing and addressing its limitations head on,” seconds Pat Metheny, himself one of jazz guitar’s most intrepid explorers, and Hall’s collaborator on one of the elder artist’s most intimate, probing recitals, the newly released Jim Hall & Pat Metheny (Telarc). “Jim found a way of increasing the dynamic range of the instrument by his special touch and picking technique and there are dozens of guitarists who have been influenced specifically by Jim’s approach-but I’ve always felt that John Scofield, Bill Frisell, John Abercrombie, Mick Goodrick, and myself all have a particular relationship to what Jim hit upon in terms of phrasing and dynamics. Yet at the same time, as much as I think we would all point to Jim as an influence, I don’t think any of us sound particularly like each other…or Jim at this point, for that matter. To me, this is the best kind of influence a musician can impart to other musicians-inspiring you to find your own thing through your own research. “And now I’m listening to all the younger guys in terms of what they’re doing with sound and phrasing,” Hall acknowledges, by way of returning the compliment. “I would hate it if I still was trying to play what I did in the ’60s,” he says, shuddering at the possibility. “I think I would be out of music. I listen to all those young guys in order to keep growing, because that’s the way my brain works, too. I see it as a family, and we listen to one another, and kind of keep the language going. That’s why it infuriates me when people talk about Miles’ ‘electric band’ and put it down. I say it’s none of our business. For me, he’s like Picasso. You wouldn’t tell Picasso to keep doing the blue period, would you? ‘Oh, I preferred your representational work. Knock it off with those warped- looking people.’ Again, I see music as a family, anyway, which is marvelous-it crosses across ethnic boundaries, gender boundaries, age boundaries, and all of the boundaries that people erect. Music doesn’t know about that. “I first met Pat when he was fifteen years old,” Jim recalls. “He had braces on his teeth and was kind of a juvenile delinquent. He had sort of semi-run away from home for a little while. I was working at a place called The Guitar with Ron Carter, and Pat came in with Atilla Zoller. Pat had won a scholarship to some Down Beat camp, and Atilla had been his teacher. So Atilla was taking him around New York. He had been up to hear Freddie Hubbard at Club Baron’s I think. And he had heard the Bill Evans Trio. So I knew him then, and I stayed aware of what he was doing when he went with Gary Burton. We did a concert at City College in 1982; he played just with Steve Rodby and I played with Ben Riley and Harvie Swartz. We played one or two duets, and then he played some with my trio, and it just seemed like we could play together. “The thing I love about Metheny on our duo record is that he gets so many different sounds. The thing he does on ‘Summertime,’ I was just awe-struck. That was just one guitar, no overdubs, like a Richie Havens strum. I’d be watching him, going, ‘Wow, look at that, what’s he going to do now?’ And I’m going, ‘Dah-duh Daah,’ and he’s going ‘Brrrrrooooommmmm!’ Then he played this thing he calls the Pikkaso guitar, with 40-some strings; he also played a nylon-string guitar, with a pick and with his fingers, and a fretless classical guitar as well as an electric guitar. Jim Hall & Pat Metheny is the culmination of Hall’s superb cycle of recordings for the Telarc label. Still radiant in the autumn of his artistic bloom, Hall’s work on Dedications and Inspirations, Dialogues, Textures, Panorama: Live at the Village Vanguard, and By Arrangement illuminates his youthful, exploratory attitude about music, showcasing him both as a master improviser and as a distinctive composer/arranger, whose music, though deeply informed by jazz, classical, and folk sources, is truly beyond category (a point driven home by Bruce Ricker’s superb documentary portrait, Jim Hall: A Life in Progress, see review on page 67 ). In a sense, these six varied Telarc recitals find him having come full circle, revisiting the inspirations of his youth, re-exploring his experiences in the conservatory, and re-affirming the directions he began to pursue as an up-and-coming musician in the 1950s-a musical aesthetic defined as much by his willingness to take a long breath as to glory in the sound of his own singular voice. Jim Hall became the antidote to rote guitar-speak, transcending the instrument’s technical entanglements to manifest a vision of the guitar as an authentic modern jazz instrument. 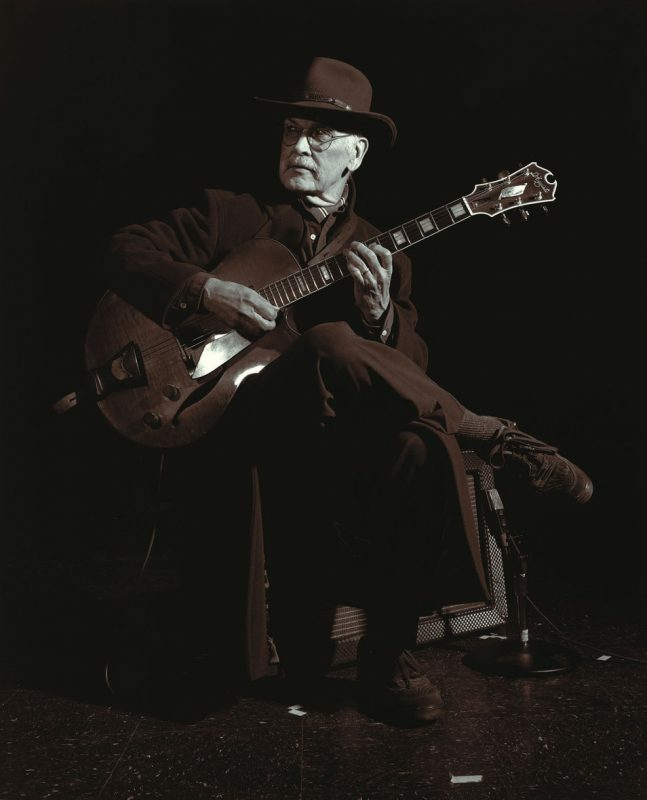 In the process, Jim Hall became an inspiration to the technically challenged amongst us, who while we might’ve aspired to develop an improviser’s vocabulary on the instrument, came away from our encounters with the likes of Django Reinhardt and Wes Montgomery and Jimi Hendrix both inspired and humbled. If not for Jim Hall, it seemed as though the only honorable alternative was to toss our instrument under the first southbound truck. “Anyway, I started on the guitar when I was nine or ten. Then I played the bass from the time I was in junior high. And I learned how to play it well enough that I could bow it to a degree. And then later on I did club date things where I played bass and sang a couple of tunes. So it was mostly bass and guitar until I got into music school, where I played a lot of piano-there was no guitar. I played piano to get in, and then I played string bass in the orchestra-which have come in real handy. I started a master’s in composition, studied a ton of counterpoint and form and analysis, took a semester of timpani and a semester of oboe, which was murder, let me tell you-I used to black out every time I tried to play it. “So that’s one factor in explaining my approach to music. And another part of it is my personality, naturally. Some people can play fast. It’s almost like being an athlete. Some people are put together differently. Again, I’m having to infer this hundreds of years later, but I was around Tal Farlow a lot when I moved to California. I had heard him with the Red Norvo Trio, which was an amazing group. And then Jimmy Raney was a good friend of mine. And Wes Montgomery…I already knew Wes’ brothers before I heard him. And I’d heard George Van Eps since I was a kid, as well. So my point is, that it’s almost like I said to myself, ‘Okay, if I practice every minute for the rest of my life, I’ll never be able to do that. So what am I doing?’ It was like I said to myself, ‘Hey dummy, do something different.’ It seemed to make sense to do something personal that had to do with me, and had more to do with me than playing the guitar. Also, something that would fit in the context of what I was doing to make a living. So part of it was survival, too. So sure, other players may have had more elaborate floor routines, but no one was more musical than Jim Hall. Sure, Johnny Smith was more commanding; Django Reinhardt and Barney Kessell had more fire; Herb Ellis and Kenny Burrell were bluesier; Wes Montgomery swung harder (than everybody) and had a more driving, angular style of phrasing; Tal Farlow and Jimmy Raney played longer, more complex melodic elisions. But Jim Hall took a little from all of them, as well as Charlie Christian, Lester Young, Ben Webster, Bill Evans, and J.S. Bach, and distilled it down into an elemental lyric style, something deeply felt and deceptively simple, to the point where he could blend in…or simply disappear. More significantly, on Jim’s first working gigs, the bands functioned more like chamber ensembles than your garden variety jazz combos-so Hall was encouraged to evolve in an unconventional manner. Quite a challenge and a blessing: to be able to enjoy such a heady brand of creative freedom on your first important jobs. “You’re telling me!” Jim laughs. “In the dictionary, where it says lucky? They have my picture there. I was really fortunate. Starting with the Chico Hamilton Group, and then two different Jimmy Giuffre trios-the one with Bob Brookmeyer and one with Ralph Pena-and the stuff with Sonny Rollins and Art Farmer, I was often in situations where I didn’t function in the normal guitar way. I had to either play written lines with Giuffre, or I’d get to write a lot, as I did for Chico Hamilton. So it had more to do with music, with a capital M, than with guitar stuff. In fact, Jimmy would get after me about things in the phrasing. If I had a written part to play with him, and he heard lots of guitar strokes-picked strokes-I think for Jimmy that sounded like tonguing on the trumpet, so he’d say ‘Would you figure out a different way to play that?’ So I got involved in using the right hand more just to set the string in motion, and do more things with the left hand, whatever you call that…legato. I approached the guitar, not so much as a guitar player, but somewhere between a piano and a tenor saxophone-anyway that’s what I hear on the guitar. I was more influenced by tenor saxophonists like Lucky Thompson, Chu Berry, Ben Webster, and Lester Young than guitarists. I loved Lester Young’s sound. He had his own way of treating harmony and melody and rhythm. He played melodies all the time, and found the most beautiful notes within a chord that outlined it. And nobody could play a ballad like Ben Webster, and of course I loved Paul Desmond. I was into Ornette right from the beginning and a few years later, when I heard Coltrane a lot, I got interested in those arpeggiated things that he did. And Miles Davis could play silence better than most guys today can play notes-anybody. “With Bob Brookmeyer and Jimmy Giuffre, here we were, three conservatory guys, exploring all sorts of traditional blues like Leadbelly and Blind Lemon Jefferson. And some of it came by osmosis through Bill Evans, too. Because I was around him a lot, and I heard him develop. The first time I met him he was in a quartet with Tony Scott…this is way before Miles, like in 1955-1956. This was with Paul Motian in Chicago when I was there with Chico Hamilton, and they were playing some other place where I stopped in to hear them. And my memory is that then Bill was playing somewhere between Bud Powell and Lennie Tristano…that is, like Bud Powell, but across the bar lines. But it still was very personal. And then I heard him when he joined Miles Davis, and I worked opposite him with Jimmy Giuffre and Bob Brookmeyer. And that would’ve been like 1958 or so. “So I heard Bill a lot, and because of the types of groups I was in, I paid particular attention to the piano players in other groups to see what they did for accompanying. And for me, Bill just brought such a wide range of textures and dynamics and different uses of the pedal. And he wasn’t afraid to be pianistic and to listen real carefully. With a lot of those kind of bebop players it had gotten to be like boxing or some kind of macho thing, and Bill really wasn’t into that. “So I think I was influenced quite a bit by the way Bill voiced chords and the way he accompanied. Like a lot of times I’ll play chords where I’ll leave the root out, because I assume the bass player has that covered anyway. And maybe just some fourths piled up, that you can move easily if you have to. And there’s all sort of triadic stuff, where anything you hear in the way of a melodic line, you can harmonize a number of different ways. I took a lot of that stuff from the first George Van Eps method book, and I would use my own chord voicings [plays a variety of different voicings over the basic diatonic movement, sometimes forcing the harmony at gunpoint, like Monk-you will resolve]. Stravinsky did that kind of thing a lot, too. Like a C chord would be [plays odd inversions]. But it’s still a C chord. “Bill? I’d describe him the same way I describe Pat-you really felt like he was inside your brain. Like I knew that Bill got a kick out of the way I played rhythm. I think of rhythm playing the way a drummer plays the hi-hat cymbal. So my hand is going all the time, and sometimes I’m not actually playing a chord. You just might hear it hitting the strings, and then I’ll play a chord where I think it’s appropriate. On ‘My Funny Valentine’ Bill really bails me out on my own solo. He hears that I’m in trouble and he leads me into the next phrase. And when I played rhythm he just instantly stopped using his left hand, because he knew that was covered. He was amazing in that way. “You’ve still got to make music, though. All of the technical things? Those are just tools, and there still has to be something personal at play. I’d rather hear B.B. King play three notes than hear a lot of guitar players play all night with their zillions of chops, because there’s something about B.B.’s intelligence. I always figured I’ve made a living recovering from mistakes. You take something where you maybe didn’t literally mean to play it, and you try and make it fit somehow-and it’s fun. So that’s more what I’m interested in-making what everyone does right for the moment and for the music. The same way that Bartok did on the Music for Strings, Percussion and Celeste. I think it’s the very opening of that [picks up his guitar and plays the part]. It starts as a fugue, with four or five parts, and then it goes to a retrograde, and pretty soon the retrograde and the original wind up in a unison and it ends like that-it’s just perfect architecture. Boy, I can just get torn up looking at the score and listening to that because I don’t know what that means philosophically, but it’s just gorgeous architecture. “I’m not involved with equipment,” Jim Hall explains, trying to be helpful, but pleading blissful ignorance in response to most inquiries involving gear. “I’m involved with people and personalities and music.” God bless. So while I went to some lengths in tormenting Jim with shop talk, if you want to know what kind of strings Jim uses on his guitars…well, sorry (they seem to be a medium-light gauge of flatwounds or halfwounds). Nor does Jim get too hung up on instruments for that matter, although he has some beauties. During Jim’s early days with Chico Hamilton, he used a black Les Paul Custom. “But only for about six months,” Jim avers. “What happened was the [Chico Hamilton] quintet had a job in a club in Long Beach, California, and it was my first experience like this. I was sitting in a chair, and there was a bar around the bandstand so that the bar came above us. The amp was going right into that, and Chico loved to play his bass drum, and he had a big drum, and I couldn’t get any highs out of this thing. So I lost control and I bought a Les Paul, but it didn’t vibrate or anything-I couldn’t play rhythm on it.” So he sold it and bought a Gibson ES-175 acoustic-electric, with which he defined his trademark sound over the next twenty years. Jim’s brown electric guitar is similar to the old ES-175 in that it’s constructed from a maple laminate, with a single built-in pickup (some sort of humbucker). The beautiful guitar pictured on page 35 is a D’Aquisto Avant Garde model, all solid tone woods, with a handcarved spruce top and a carved maple back, a maple neck, ebony fretboard, and a number of unique D’Aquisto appointments, including a handcarved ebony tailpiece, an extra large adjustable bridge and oval sound holes. You could write a treatise on D’Aquisto’s design considerations, but suffice it to say, this guitar is alive. A magnificent instrument. But the Gibson tube amp just got too fragile. Nowadays Jim uses a Walter Woods solid-state power amp, a Harry Kolbe tube pre-amp, and a Kolbe tuned speaker enclosure originally designed for bass. Oddly enough, when you listen to Jim Hall & Pat Metheny, you’ll notice that the more intensely Jim plays, particularly on rhythm passages, the more he turns down. And the lighter and more fluid his picking becomes-the more legato his left hand-the more he turns up. “It wasn’t completely conscious, but I worked out a way where I could use the amplifier to actually play softer. Where it would enhance the guitar sound and I could use a softer string, and a lower string tension and still get some sustain. So I probably use the amp a little bit differently from how it had been used before. It was just a sound that I was going for, more like a saxophone than a typical guitar. I loved Lester Young and Ben Webster’s sound, and Paul Desmond’s, too. It’s a different way of approaching the electric guitar…not like a track meet-more like a walk on a pier at sunset. Undercurrent with Bill Evans was my favorite record for several years, and I feel that it subtly altered the course of jazz forever. Sonny Rollins’ The Bridge is a record that opened the door for an entirely new way of thinking what the guitar can be in jazz, both as a solo instrument and in a rhythm section. In addition, I always loved a record of Jim’s called Where Would I Be (OJC). And then, of course, there were his amazing duets with Ron Carter on Alone Together (OJC). I was so thrilled and honored to be invited by Jim to do this record. It is the first all duet record with another guitarist that either of us has ever done. Of course, like most of the jazz guitarists of my generation, I consider Jim to be one of the two or three major forces in the development of our instrument as a jazz instrument. But beyond my high regard for Jim’s historical innovations and the major impact his playing has had on me as a musician, there has always been something special in our encounters as players, particularly in a duet setting-a special kind of communication that I have found to be rare. Our common ground as musicians seems to be more in the area of listening, more so than in the actual playing. My own sound keeps changing, and I hope it continues to, and I really just try to come up with the right answer to what the setting and the sound of the situation and the music I’m playing seems to suggest to me at the time. The “blend factor” is really important to me-so I try to play with a sound that fits the sounds of the other instruments around me. I think Jim does this too, but he does kind of insist that everyone play at his dynamic level. One thing is for sure-I have never played electric guitar that soft before except at home. One of my favorite recordings of Jim’s was from a few years ago on a quartet record he made with Tom Harrell. It was just the right proportion of mike on the guitar, to mike on the amp. This is a very delicate issue. You can very easily wind up with a thin, twangy kind of a sound-the exact opposite of what you are usually hoping for when you stick a mike up in there in the name of making it more acoustic or “pure” sounding. Because there was so much space on the record, it being just two guitars, it was possible to really let each instrument have a lot of room. We also both wanted to have a lot of variety on the record. So some tracks are live, some are in the studio; some are very dry, some have a little reverb on them. We just wanted to really explore all the different kinds of things we could be as a duo. The record was fascinating to make and very intense. It was a chance for us to explore the kinds of things that we had often done in our previous musical encounters. I can remember one set we did on a tour in France where we just improvised the whole set and ended with a standard. The improvised stuff on the record is quite unlike any of the “free” playing that I have ever done with anyone else in that it is almost song-like and yet densely harmonic. I think we both tend to think orchestrally anyway, and when we play “free” that aspect of the music seems to come out.